1. Measure 1 cup cheese and set aside. 2. 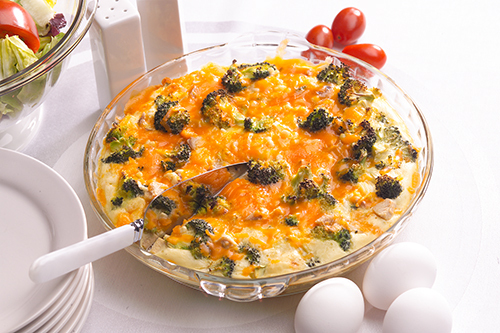 Combine 2 cups of cheese, broccoli, cooked diced turkey and onion; spread into a greased 10 inch pie plate. 3. In a small mixing bowl, beat the milk, eggs, biscuit mix, salt and pepper until smooth. Pour over broccoli mixture. (Do not stir). 4. Bake in a preheated oven at 400°F for 30-35 minutes or until a knife inserted in the centre comes out clean. 5. Sprinkle with the remaining cheese. Let stand for 5 minutes or until cheese is melted.